Advance forage balancer specifically formulated to deliver optimal key vitamins, minerals & amino acids to support the growth and development of youngstock. 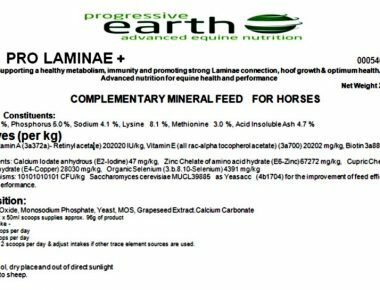 This superior powdered equine balancer has been specifically formulated to contain the commonly deficient minerals, vitamins and amino acids at the optimum levels required to support the increased nutritional demands of the growing equine. These key ingredients are critically important for building strong bones, tendons, ligaments, muscles, teeth, and vital organs. Also includes Vistacell to support gastrointestinal health and integrity. 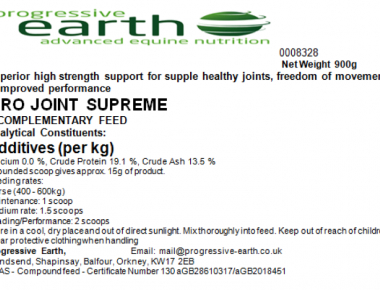 1 & half scoops (70g) for 250kg horse. 3 x Scoops (140g) for 500kg horse. 1 x level scoop gives approximately 46.6g of product. Pro Youngster is a powdered supplement which we recommend is mixed with a damp base feed, such as alfalfa, beet pulp, wheat bran and/or copra meal etc. When feeding for the first time, it is recommended to introduce gradually over a period of 5-7 days. Analytical Constituents: Calcium 12.8 %, Phosphorus 7.1 %, Sodium 0.6 %, Lysine 14.3 %, Methionine 3.5 %, Acid Insoluble Ash 2.9 %, Magnesium 1.4%, Crude Protein 25.5%, Crude Fibre 0.37%, Ash 53%. Micro-Organisms: 178571428571 CFU/kg Saccharomyces cerevisiae MUCL39885 as Vistacell (4b1710) for the improvement of feed efficiency. Any questions? If there are any questions about Pro Youngster or any other of our range of products, please contact us by email. 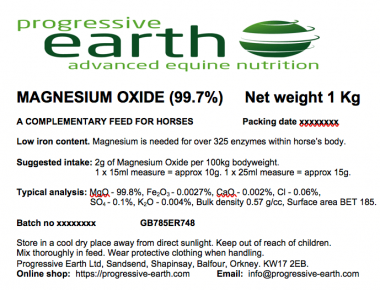 Pack size and availability: Progressive Earth Pro Youngster equine youngstock feed supplement is available in resealable grip seal pouches containing 4.2 Kg of product. A 50ml scoop is included.